Barren tundra-covered hills dominate the landscape of the Pribilof Islands. But these island also host the largest seabird colony in the Northern Hemisphere with 98 percent of the world population of Red-legged Kittiwake (Rissa brevirostris). In addition, the strongest breeding colony of Parakeet Auklet (Cyclorrhynchus psittacula) and possibly also the biggest colony of the small Least Auklet (Aethia pusilla) exist on St. Paul. The largest number of breeding birds can be found from the end of May until the summer. Of course, the number of species is low, but the population density is high. During our four-day stay on the Pribilof we – led by a guide from High Lonesome Tours – we could observe the entire breeding spectrum of bird species. Many birders come in addition to the breeding birds but mainly because of the feathered vagrants on the Pribilof. Already on the first day of arrival we saw a common bird for the WP-birdwatcher. But here, this duck is very rare. It was the Tufted Duck (Aythya fuligula), a beautiful male in full breeding plumage. Additionally a Mongolian Plover – or Lesser Sand Plover – (Charadrius mongolus), a Greenshank (Tringa nebularia), at least 5 Wood Sandpiper (Tringa glareola), 3 Long-toe Stints (Calidris subminuta), a Slaty-backed Gull (Larus schistisagus) were other highlights. In the following days to come a Siberian Rubythroat (Luscinia calliope) and at least 2 Northern Wheatear (Oenanthe oenanthe) completed the rarities list. Looking for Vagrants at the northernmost tip of the island of St. Paul, resulted in a perfect male Siberian Rubythroat on the 24th of May 2016. When we arrived in Hutchinsons Hill (how this small hill is named), we first walked in line along the hill. But besides an Arctic Fox and the abundant Lapland Longspur (Calcarius lapponicus) and Snow Bunting (Plectrophenax nivalis), we did not see something. Suddenly, our leader shouted out: “ Siberian Rubythroat”, and again “ Siberian Rubythroat”. Immediately the group was highly alerted. The 2nd leader had to push a bit for discipline because everybody wanted to get perfect views and – even more important – excellent photos. 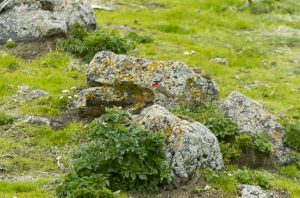 Finally the Siberian Rubythroat could be pinned-down in a combination of green vegetation – probably sellery – and dried grass. The views in the scope were short but striking. Then the bird flew away. Without hope, we started sitting and wait for more vagrants to come. After a while, someone got a glimpse on a brownish bird, which turned out to be a Northern Wheatear (Oenanthe oenanthe). The bird passed the hill, where we were all sitting in only a few meters distance and landed behind some rocks with beautiful yellow lichen. After a while it was seen, 20 meters away from the site, where it disappeared. It turned to be difficult to fix the scope on the standing bird. Constantly hopping and running, it could make its way in the stony and grassy area with remarkable speed. Finally the bird stayed for some seconds in quite a distance, turning around and showing its beautiful ruby throat to us – as you see in the image of the blog. Although we knew, that there are reports of Siberian Rubythroat from East landing, we did not expect this bird on the northernmost tip of the island. Certainly one of the megas of this very productive trip. If you need the Siberian Rubythroat to see close-up, you better go for sites of the regular migration channel. An excellent recommendation is Happy Island in the Yellow Sea of China, where nice shots of migrating birds were taken. We were a group of 10 birders travelling to the Pribilofs with High Lonesome. We had exiting observations with great adventure with great leaders and excellent organization. St. Paul, die biggest island of the Pribilofs, is more or less in the middle of nowhere in the Bering Sea. The Island has been a mecca for ABA birders for over 25 years. Although conditions were originally quite rustic they are now very decent. A variety of tour companies lead trips to Gambell and because of the very complicated logistics I would suggest this is certainly the easiest, most comfortable way to bird St. Paul. The island has one hotel, the King Eider Hotel right besides the airfield. If you want to stay here it’s best to book a tour package or book the hotel very early because it’s mostly booked out during end of May and in June. Although you might see most of the island specialties in walking distance from the village, sometimes long hikes are necessary! Much more time-effective it is to use a car. I travelled to the Pribilofs as well as Nome and Gambell this spring with High Lonesome and it was a great adventure with great leaders and excellent organization and support. Accommodation and meals were great – especially considering the location. Birding Alaska is always a bit of a crap shoot given the weather and off beat locations. Stories of delayed planes, baggage on the next plane for days and people being stranded in various places abound. In order to satisfy the growing demand for top shots of the rarer species of Palearctic, Bird-lens.com has undertaken targeted travel to near and distant bird areas. This is to be able to do anything to provide excellent images of the birds of the Western Palearctic. The results in images even of rare Western Palearctic birds are very good. Very nice images bird-lens.com could bring back home among others from Europe from Scandinavia (Norway, Sweden, Finland, Denmark), from Holland, from England, Poland, Austria, France, Portugal, Spain and of course from Germany. The beautiful images of the blog are only first impressions of what you will find in behind “Picture Shop” very soon. Simply contact bird-lens.com if you need an image of a bird before even more new pictures are online. Previous PostHigh Lonesome BirdTours St. Paul Trip 2016Next PostNach Alaska für die WP-Birdlist?